Bring water to a brisk boil in a medium saucepan. Slowly stir in the grits and salt. Reduce heat to low and simmer uncovered until thickened (about 15-20 minutes), stirring often. Remove from the stove and immediately stir in the 4 TB of butter. Refrigerate overnight. Spray a large, non-stick skillet with the butter-flavored cooking spray. Add 4 TB of the butter to the pan and melt over medium heat. Keeping them separated, add the grits balls to the pan. Flatten the balls a little into patties with a silicone spatula as you go, keeping the round shape best as possible, and cook until the butter is absorbed (about 15 minutes). Carefully flip the patties with the spatula and add 2 more TB of butter to the pan. Saute another approximate 15 minutes, or until golden brown each side. Serve warm. Here's a photo taken a couple of months back of my grandchildren with their dad...he's the best! My mother would serve a piece of cake to you, then immediately rip it out of your hand so she could examine the texture...always a big concern of hers. Now, my children complain they can't enjoy anything I make without my barraging them with questions about it...like mother, like daughter, I guess! I have a cute little story to share with you: When we were young, we had a neighborhood grocery store. My mother sent my sister (she was probably about seven or eight years old) to the store to get a pound cake. She was gone quite a while; and when we checked on her, she was weighing every cake in the store to find one that weighed exactly one pound! We submitted this story to the local newspaper's magazine section, and it was printed along with a cartoon drawing of her weighing the cakes...which we felt looked just like her, ponytail and all! I adapted this pound cake from a recipe I found in the newspaper many years ago, and it has quite a history. The Reverend Beverly Asbury named his cake The Bishop Asbury Pound Cake. There was a Bishop Francis Asbury; however, Reverend Beverly Asbury was unaware of any family connection. This is as close as I've seen to a true pound cake, which would actually have one pound each of the main ingredients. It's tender and buttery and definitely the tallest and richest pound cake I've made...so, if you want to wow everyone with your pound cake, this would be it! Oh, What a Pretty Texture! Grease and flour a 10" tube pan (not a Bundt pan...the batter will overflow) with the non-stick baking spray. If you use a tube pan with a removable insert, please see my Very Happy Birthday Pound Cake with Rich Chocolate Frosting with photos on how to line the pan with wax paper. Lay a sheet of aluminum foil on the rack below the one you will bake the cake on, just in case your pan leaks a little grease and/or cake batter. Cream the butter and sugar together until light and fluffy. Scrape the bowl. Using a medium mixer speed, add the eggs one at a time just until the yellow disappears...be careful not to over mix! Scrape the bowl again. Whisk the mace into the flour and incorporate about 1 c. of the dry ingredients at a time to the batter. Scrape the bowl one last time and give the batter a little extra mix. Pour the batter into the pan* and bake for approximately 1 hour and 45 minutes, or until a toothpick comes out clean when inserted and the cake springs back when gently pressed with your finger. Gently run a very thin-bladed knife around the edges and tube of the pan, then invert the cake onto a serving dish. Carefully remove the tube and wax paper, if used. *Tip: Mother taught me to achieve a pretty texture in a cake, run a knife in opposite directions through the batter; but since the pan I use for this cake has a removable tube, I don't run it all the way to the bottom of the pan. Also, when I use my pan with a removable tube, I skip the next step which would be to drop your filled cake pan(s) on the counter a few times to release air bubbles. When I do drop any cake pan(s) with batter on the counter, I always land up with batter on my ceiling, or unpredictable places, but I surely do have a cake with a pretty texture! Pound cakes are best when you let them rest a day or two, and they freeze great (which makes them even more moist)! I like to serve this wonderful pound cake as shortcake with a premium vanilla ice cream and/or whipped cream with crushed strawberries or fresh, sliced peaches. See my Black Forest Cherry Trifle for preparing the whipped cream. For the strawberries, I just wash, remove the stems, slice, crush and serve with no added sugar! Also, don't hesitate to enjoy this cake plain or toasted with a good cup of coffee. 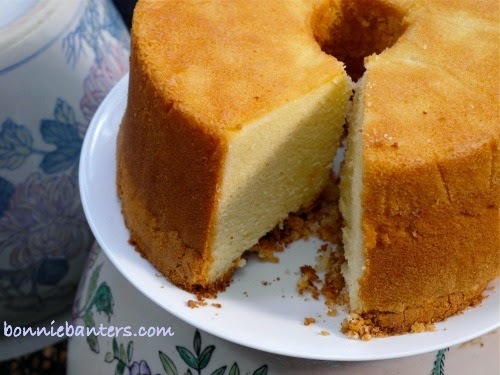 Having a good pound cake around is a Southern must...it's so versatile and perfect for drop-in guests!